That’s Old News: What the heck was Mother’s Friend? We often look back a hundred or two hundred years ago and think of it as the “simple life”. Hard work and none of the problems of modern life. But, was it really that way or did they just have different problems? Wow! That makes childbirth sound like so much fun. NOT! 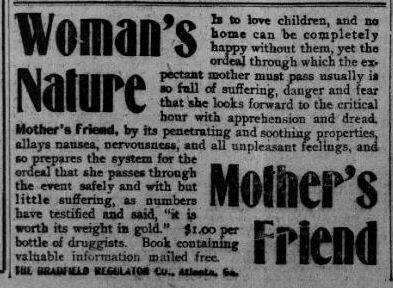 Mother’s Friend has “soothing and penetrating properties”. It can deal with nausea, nervousness, unpleasant feelings. It even helps the woman pass through the “event” safely. Notice that pregnancy and childbirth aren’t even mentioned? This gem cost $1.00 per bottle. Even comes with a book with valuable information. What a steal. So, what was Mother’s Friend? Was it an ointment, a drug, a herbal concoction, sugar water? I have no clue because the ad never says. But, now I’ll I have is the Rolling Stone’s “Mother’s Little Helper” rolling around in my head.